Methane flaring wastes millions of dollars on Utah’s public lands, but are federal limits a good solution or an undue burden? 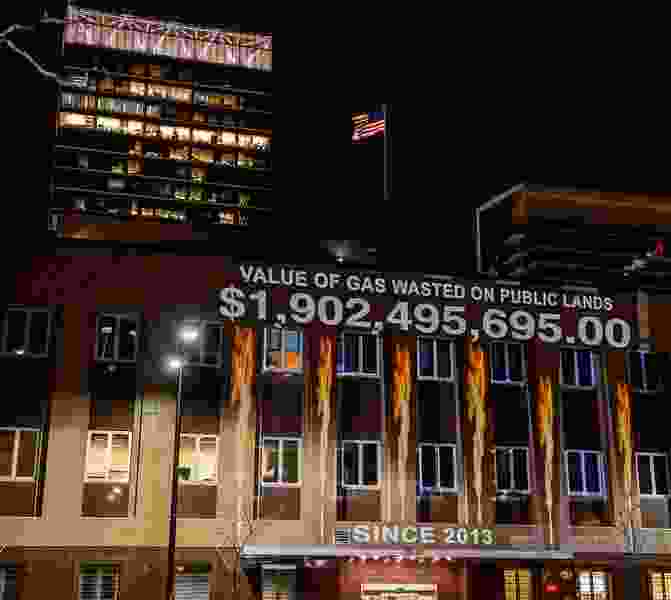 (Trent Nelson | The Salt Lake Tribune) In a visual protest, the group Alliance for Better Utah projects the total dollar value of natural gas lost on public lands since 2013 due to venting, flaring, and leaking onto the side of Federal Reserve Building in Salt Lake City, Thursday April 5, 2018. President Trump’s Interior Department is poised to rollback Obama-era rules requiring oil and gas operations on public lands to capture that natural gas instead of burning it. (AP file photo) Workers tend to oil pump jacks behind a natural gas flare near Watford City, N.D. The Trump administration is poised to roll back Obama-era rules on flaring on public lands, including oil and gas operations in Utah. Environmentalists say the reversal will cost taxpayers billions of dollars. The Interior Department is poised to dramatically roll back new methane-waste prevention rules for oil and gas operations on public and tribal lands. The measures, referred to collectively as the methane rule, were expected to capture up to $1 billion worth of natural gas that would otherwise be flared at well heads or released directly into the atmosphere over the next 10 years. While environmental and good-government groups decry what they see as avoidable waste and pollution, energy producers complain the rule’s $172 million annual compliance cost is too high while achieving few benefits. Finalized at the end of Barack Obama’s tenure as president, the Bureau of Land Management’s methane rule imposes redundant regulatory burdens on an industry already hit with low commodity prices, according to criticism from Utah state officials and the energy industry. The requirements, those critics say, could actually slow significant strides the industry has made on a voluntary basis to reduce methane emissions. But according to the Environmental Defense Fund (EDF), $330 million worth of natural gas is lost annually through flaring, venting and leaks on wells and other facilities on public and tribal lands, mostly in five Western states. Utah’s share of that is 9.5 billion cubic feet, worth $28.4 million. And some of those emissions also contribute to the Uinta Basin’s wintertime ozone problem — a situation that is expected to lead portions of eastern Utah to be officially labeled as out of compliance with federal air quality standards, according to Jon Goldstein, EDF’s senior policy manager for climate and energy. The environmental group calculates that the natural gas lost on public lands since 2013 is worth $1.9 billion and counting. 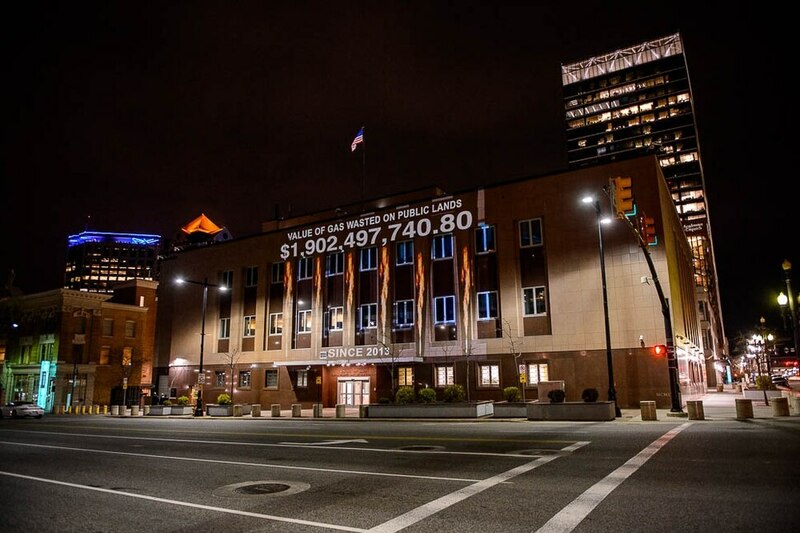 And in a protest last week, the government watchdog group Alliance for a Better Utah projected the latest number, $1,902,497,507.60, onto the side of the Federal Reserve building in downtown Salt Lake City, to illustrate the need to keep the methane rule. (Trent Nelson | The Salt Lake Tribune) In a visual protest, Alliance for Better Utah projects the total dollar value of natural gas lost on public lands since 2013 due to venting, flaring, and leaking onto the side of Federal Reserve Building in Salt Lake City, Thursday April 5, 2018. (Trent Nelson | The Salt Lake Tribune) In a visual protest, Alliance for Better Utah projects the total dollar value of natural gas lost on public lands since 2013 due to venting, flaring, and leaking onto the side of Federal Reserve Building in Salt Lake City, Thursday April 5, 2018. (Trent Nelson | The Salt Lake Tribune) In a visual protest, Alliance for Better Utah projects the total dollar value of natural gas lost on public lands since 2013 due to venting, flaring, and leaking onto the side of Federal Reserve Building in Salt Lake City, Thursday April 5, 2018. (Trent Nelson | The Salt Lake Tribune) In a visual protest, Alliance for Better Utah projects the total dollar value of natural gas lost on public lands since 2013 due to venting, flaring, and leaking onto the side of Federal Reserve Building in Salt Lake City, Thursday April 5, 2018. 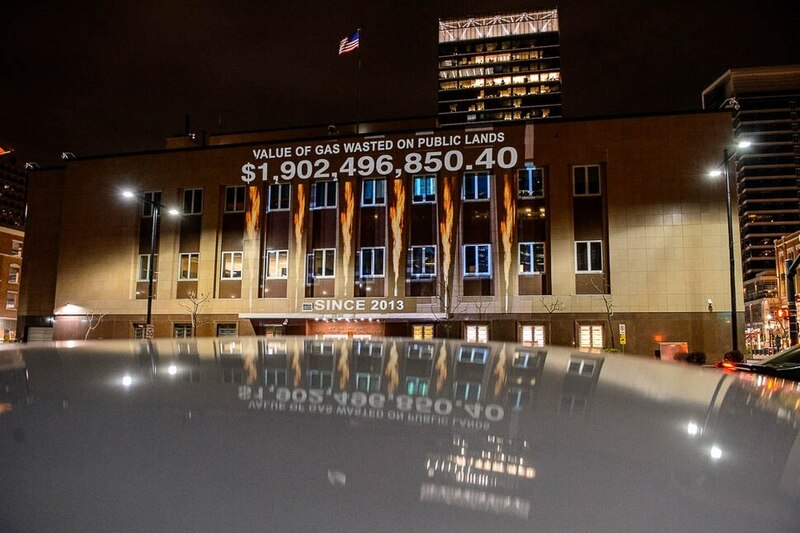 (Trent Nelson | The Salt Lake Tribune) In a visual protest, Alliance for Better Utah projects the total dollar value of natural gas lost on public lands since 2013 due to venting, flaring, and leaking onto the side of Federal Reserve Building in Salt Lake City, Thursday April 5, 2018. (Trent Nelson | The Salt Lake Tribune) In a visual protest, Alliance for Better Utah projects the total dollar value of natural gas lost on public lands since 2013 due to venting, flaring, and leaking onto the side of Federal Reserve Building in Salt Lake City, Thursday April 5, 2018. 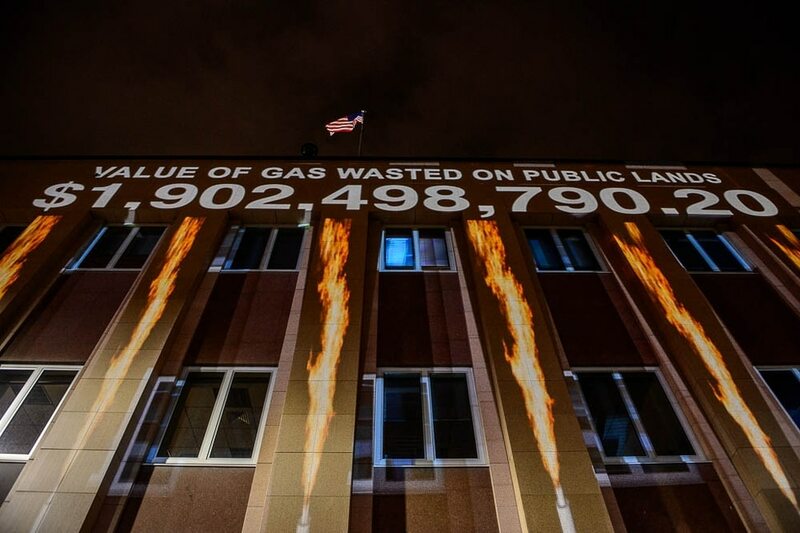 (Trent Nelson | The Salt Lake Tribune) In a visual protest, Alliance for Better Utah projects the total dollar value of natural gas lost on public lands since 2013 due to venting, flaring, and leaking onto the side of Federal Reserve Building in Salt Lake City, Thursday April 5, 2018. The rules require companies to install equipment that is less prone to emit natural gas and to search for leaks in pipelines and compressors and plug them. The requirements also limit the amount of methane that can be flared and vented at oil wells, potentially requiring costly upgrades to capture the potent greenhouse gas. But under the leadership of Interior Secretary Ryan Zinke, the BLM has reversed its position on the effectiveness and need for the rule. In February, Interior announced proposed revisions, largely gutting the rule, and those changes are up for public comment through Monday. Thousands of people have expressed their support for keeping the rule, while some Western members of Congress are applauding the BLM’s proposed revisions. Rep. Rob Bishop, R-Utah, blasted the Obama-era rule as a deliberate effort to stifle domestic energy development. In reversing the rule, the BLM now contends the cost of compliancewill exceed it benefits, essentially agreeing with Bishop and other critics. The agency is referring to wells whose daily output is equivalent to 10 barrels of oil or less. Nearly 69,000 such wells operate on federal and tribal lands, representing about three-fourths of all wells. The BLM also has lost confidence the methane rule will survive legal challenges or that its requirements are even necessary. Industry lawsuits say the rule represents an out-of-bounds reach by officials at the BLM into regulating air quality. While a California federal court declined to issue an injunction, a Wyoming federal court recently blocked the rule’s enforcement while it is being revised. And while the Ute Indian Tribe and the state of Utah are at odds over an array of other public-lands issues, they are united in opposing the methane rule. The tribe is “gravely concerned” about the rule’s potential to depress production from oil and gas deposits on its reservation in the Uinta Basin and to encroach on tribal sovereignty. “The federal goal with respect to tribal lands should be to defer to tribes to make decisions about industry regulation rather than BLM imposing what it thinks is in the public’s best interest,” the tribe wrote in its comments on the initial rule. Meanwhile, major industry players are willing to invest in upgrades to staunch the loss of natural gas since these emissions mean lost revenue, but usually when it makes economic sense. Most flaring occurs at oil wells, where methane is a byproduct and the well operator has no way to get it to market. Capturing the natural gas requires pipelines, compressing the gas for transport by truck, or converting it to fertilizer in portable factories brought to the wells. Interior says industry is successfully reducing emissions on a voluntary basis. Its Federal Register posting cites XTO Energy, which operates 2,435 BLM-administered leases, including hundreds of wells in Utah. The Exxon subsidiary is phasing out high-bleed pneumatic devices over three years and will implement an enhanced leak detection and repair, two key requirements in the Obama rule. Other big companies such as Anadarko and EOG Resources have the resources to invest in upgrades that limit waste and have agreed to do so. But smaller outfits, which often buy wells nearing the end of their productivity, have neither the cash nor the incentives to capture the emissions and would opt to plug their wells if forced to comply with the old rule, according to the Western Energy Alliance, an industry group that sued the BLM over the rule, then praised the agency for suspending its implementation. Even if the rule is suspended, said the alliance’s president Kathleen Sgamma, industry is on target to continue its long-term trends of cutting methane emissions by nearly 20 percent while boosting natural gas production over 50 percent. The state of Utah also has its own flaring limits on the public lands it owns, capped at 1,800 thousand cubic feet per month at a single well. Operators that exceed that limit must seek special permission from the state Divisions of Oil, Gas and Mining (DOGM). State officials also carefully tracks flaring as part of its mission to maximize recovery of oil and gas. Last year, Utah oil and gas field’s flared 2.3 million Mcf, a 11.5 percent reduction from 2013, according to DOGM data. The BLM now says those state flare limits are adequate for reducing methane loss at oil wells, but activists disagree. “In tribal communities, oil and gas is a vital source of revenue but for too long they have allowed them to vent and flare natural gas recklessly without paying any royalties,” said Laurie Weahkee, a Navajo who serve as executive director for the Native American Voter Alliance.